We provide complete robust process validation service to avoid GMP-related recalls associated with post-production problems. The primary reasons for those problems include poorly characterized product design and manufacturing processes, inadequate or poorly planned and executed design and process validations, and lack of adequate production controls. As a result, customers are exposed to unnecessary hazards, product quality is inconsistent, and businesses are adversely affected. 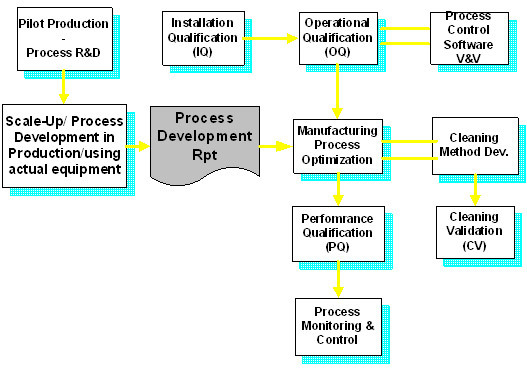 Process Requirements are defined by the processes’ ability to produce product meeting predetermined specifications. 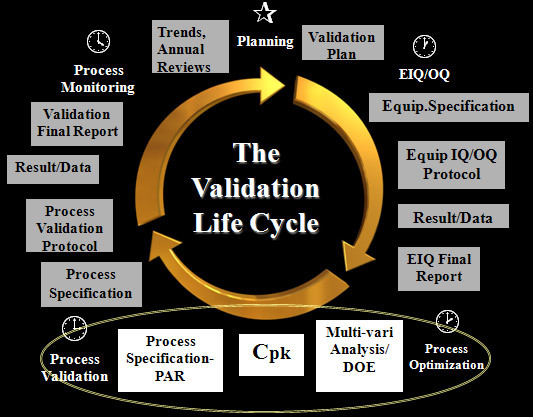 This service covers the elements of process validation and present industry “best practices”. Service includes design verification and validation, process validation planning, and installation, operation and performance qualification, and process validation. Validation requires that you first establish a process that can consistently conform to requirements and then that you run studies demonstrating that this is the case. Our process validation approach is based on Proven Acceptable Range (PAR) so that expected performance of the process relative to the end- product’s ability meets pre-determined specifications. Installation Qualification: Establishing by objective evidence that all key aspects of the process equipment and ancillary system installation adhere to the approved design criteria and that the recommendations of the manufacturer of the equipment are suitably considered. Operational Qualification: Establishing by objective evidence parameters which result in production that meets all predetermination requirements. Performance Qualification: Establishing by objective evidence that the process, under anticipated conditions, including worst case conditions, consistently produces a product which meets all predetermined requirements. Process Validation: Establishing by objective evidence that a process consistently produces a result or product meeting its predetermination specifications.